The Puppy Steps Programme grew out of the recognition that puppies and their handlers put such a lot of effort into their training, yet under the previous training structure, they would have had to wait until they passed out from Starter Class before all their efforts would be formally recognised by the club. So The Puppy Steps Programme was born! It is hard to believe that The Puppy Steps Programme has been running for over a year! The first certificates were presented on 09/06/2013. So I thought it would be good to update and remind everyone of what is involved in The Puppy Steps Programme. The programme content remains deeply embedded within the club’s basic principles of training. The basis of the training is that it needs to be fun for all dogs and handlers. Therefore we emphasise the use positive training method with treats, toys and praise. In addition, we try to ensure that the training is based in and emphasizes the needs of the dogs / handlers in their everyday lives. Once the handler and puppy will have attended at least 10-12 training sessions. The Puppy Steps Programme fundamentally helps handlers support their puppies to develop positive life skills. This assists the puppies to be well mannered, confident, chilled out and a pleasure to be around. The emphasis is on how the handler helps the puppy to learn appropriately and consistently rather than on the skills demonstrated by the puppy. The areas covered in The Puppy Steps Programme include: Be able to get and keep your puppy’s attention, learning good manners, play and the appropriate use of toys, puppy recall, helping the puppy to relax and learn to be calm and improving your puppy’s confidence. Please take a look at the gallery to see The Puppy Steps Programme in action. From the Trainers’ perspectives the most significant developments, since start of The Puppy Steps Programme, are that the puppies and handlers are a visible and active presence at the centre of the club. 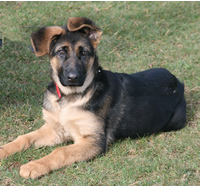 In addition, they have been enabled to build friendships and share the challenges and joys of owning a GSD Puppy. It has been great to see puppies and handlers enjoying the fun days and other activities. It has also been great to see so many puppies in both the coffee room and in the club after training sessions relaxing and enjoying light refreshments. The website also has a The Puppy Steps Programme Gallery of most of the puppies with their handlers being presented with their certificate and rosettes for you all to admire. I would like to thank Julie, the other Puppy Trainer, for her support with The Puppy Steps Programme. Also I want to thanks to Sharon who steps in (usually at very short notice) to help out with the puppy class when needed. We all enjoy the challenge of working with this rewarding group and thanks also go to all puppies and handlers who offer us the opportunities to learn more about GSDs and puppies in particular. We look forward to another successful year of The Puppy Steps Programme.